The EMOW 1300mAh Variable Voltage Battery from Kanger is a powerful battery that will give you hours of vaping pleasure, usually approx. 1.5 days. These batteries are made of shiny stainless steel that gives it a sleek look as well as high-quality durability and is available in black, cherry, brown stainless and blue. 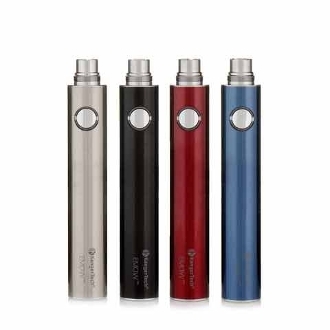 Its variable voltage feature also allows you to adjust the voltage of your battery to accommodate different clearomizers and e-liquids. This gives you the opportunity to have more control of your vaping experience. The voltage range of this powerful lithium ion battery is 3.2v to 4.8v. Simply rapidly depress the button 5 times to cycle through the voltage levels. There are 3 voltage settings: 3.7V (red light), 4.2V (green light), 4.8V (white light). The Kanger EMOW 1300mAh Variable Voltage Battery is a classy, yet durable choice for anyone in search of a great battery with a lengthy lifespan and sleek look. 1. Screw the battery into the USB charger. 2. Plug the USB charger into the USB port of the EGO USB Wall Charger. FYI: The initial charge should be for 8 hours. After that, all additional charges should be for no more than 4 hours at a time. Do not leave the battery on the charge once it is fully charged. Doing so can cause damage to your battery and may cause it to malfunction or not work at all.